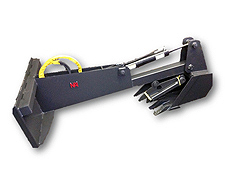 NAI's Backhoe Boom is an excellent attachment for digging ditches, removing stumps and digging footings. With the option of adding a thumb, you can move logs, chunks of cement or just about anything else you can think of. Buckets come in sizes of 8 inch, 12 inch, 16 inch and 20 inch. The bucket is powered by an American made 3 inch bore x 16 inch stroke cylinder. With 7 foot of digging depth and 14,000 lbs. of ripping force, it is an aggressive digging machine. •Bucket included and sizes available 8", 12", 16"